This organizer definitely helped get my mail “hotspot” in order. It’s a good quality and a little bigger than I expexted. Honey-Can-Do OFC-03611 Desk Organizer, Espresso. 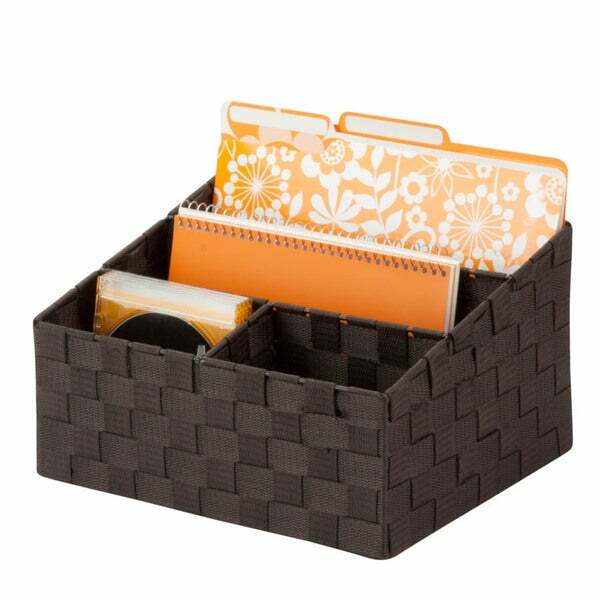 Perfect for organizing mail, notepads and other desktop essentials, this organizer features two large compartments and two small compartments for displaying its contents. The strong weave of the double woven straps and the durable steel wire frame ensure the items in the organizer will stay in one place. The modern design is practical and complements any home or office decor. Coordinates with other pieces in Honey-Can-Do's collection of double woven office products. This is perfect for organizing mail and letters to be filed away. Not really meant to be a long term solution though given only 4 slots. Great for the price and seems like good quality.